A walk in any local market in Myanmar presents interesting aromas and colorful displays of local fare, from fruits and local preparations to packets and open heaps of small bite sized pieces of jaggery. The pale gold semi-circular pieces are served as dessert after meals in restaurants, as snack in teashops, and as candy to fill in the long gaps between meals. It is interesting to find this small piece leave a pleasant, lingering aftertaste, long after it has been digested. Unlike anything one may have tasted, jaggery is an unrefined sweet made out of palm toddy in Myanmar and other tropical countries. Jaggery has caught the attention of nutritionists and health professionals who have seen the damage caused by refined white sugar. As an unrefined natural sweetener, that is a food in itself, jaggery retains all the vitamins and minerals found in the sap of palm trees called toddy. Its earthy, caramelized taste comes from the cooking of sap in iron utensils, till it thickens, after which it is poured into moulds and cooled. An estimated 80 million kilograms of jaggery is produced every season, and it finds its way into homes and cuisines all over the world. Jaggery is also made out of sugarcane juice, that is squeezed out of the long bamboo like cane fruit with the aid of machines. It has to be similarly cooked to thicken and is then cooled and sold in bigger chunks. Countries like India have a rich harvest of sugarcane, which is divided between making jaggery and refined sugar. Cane jaggery is a deeper gold in color due to the darker color of the cane juice, unlike palm toddy which is white and translucent. Palm jaggery however, is healthier, richer in minerals and a better taste with a slight caramelized saltiness. Jaggery making is one of the significant rural based cottage industries in Asian countries like Myanmar, Sri Lanka, India and Bangladesh. Requiring minimal capital investment without mechanization or expensive refining involved, it is labor intensive and hence a source of employment, which helps alleviate families out of poverty. Not without risks, the key skill required is tree climbing to collect sap and the returns in the form of earnings are dwindling, leading to a reduction in the number of tappers left in Myanmar. Jaggery is made out of the sap collected from palm trees. Palms have been known to be the oldest flowering plants since the beginning of civilization, and tapped for centuries to intercept the sugar before it reaches the fruit and its non-edible parts. The palm family, Arecaceae, has many species that produce enough sap that can be converted into sugar and jaggery, though Palmyra palms, coconut and date palms are tapped the most. The sap is called sweet toddy due to its high sucrose content (between 10-20%), and the palm trees get to be called toddy palms. Palm trees are found in central Myanmar which is also the dry zone. Large toddy farms spread over hundreds of acres in Mandalay’s Kyautpadaung township and Magwe’s Yanangyaung, Chauk and Yesagyo townships. The trees grow in groves and are ready with rich sap after fifteen years of maturity. The tall trees produce so much sap that it can be collected twice a day, and the process has to continue on a daily basis or else the sap flow will diminish and eventually stop. The process then has to be started from scratch, which can take up to two weeks. To harvest the sap, bamboo ladders are tied to the palm tress that rise to be 25-30 meters high. The first step of tapping is to cut the leaves, make deep cuts on the tree trunk, and hang clay pots into which the sap collects over the day. Multiple pots are hung on each tree and these are collected and replaced at least twice a day. Collection time is generally around 5-6 am every morning and then around 3 pm in the afternoon. The harvesting season lasts for eight months in the year in Upper Myanmar, while central Myanmar trees can be tapped all year around albeit with a period of low productivity between November and June. The quantity collected also depends on the agility and expertise of the worker. Typically workers are able to climb 25-50 trees in a day, and an average of 5 liters per tree is collected daily. Toddy sells for approximately 1000 kyat per viss (equivalent to 1.6 kg). The clay pots are first lined with slacked lime to delay the fermentation process since the sap has a short shelf life. It can be preserved at room temperature for a maximum of 24 hours, or a bit more, if refrigerated. Tappers carry back multiple pots after climbing 25-50 trees per session, twice a day. At home, fireplaces are kept ready to The sap is then filtered and lime sedimentation removed before it is transferred to iron pots and placed on high heat. The fuel typically used in rural areas, close to the palm trees, is bean husk, cow dump and chipped palm leaves. Being rich in moisture, it has to be cooked for 3 hours to get rid of the water content, remove the frothy white scum that appears on top, and then allow it to thicken. Adding a bit of oil prevents crystallization and small round balls are made while it is still hot. Palm jaggery can be used to make refined white sugar, which is higher in price, but this inferior in quality to cane sugar, and hence has low demand. Jaggery is a part of the common man’s diet while white sugar considered a luxury. Of late, the demand for organic palm jaggery is increasing in international markets. Companies like the 555 Shwe hintha Company, have been promoting their brand Royal Jaggery, and have begun their exports to Japan. Some of the traditional Myanmar candies include round pieces of jaggery mixed with tamarind, coconut and jaggery candy and of course, lemon flavored jaggery candy. Famous domestically as Myanmar’s chocolate, jaggery is an all day snack savoured by young and old alike. Than Nyat Khe, its Myanmar name, has become a craze of late even among the country’s expatriate community, thanks to the innovative efforts of a medical graduate, who decided to make bite sized pieces of jaggery to prevent wastage of chunks offered, which were always too sweet and too big to finish, and even added local organic ingredients like coconut, ginger, lemon, mint and yoghurt. Ma Cho Lei Aung, started her brand Tree Food in September 2015 to promote bite sized pieces of jaggery in artistically self- designed paper bags, and catch the eye of the youth all over again. Jaggery had in recent times, lost out to imported candies which are not even healthy options. The natural earthy goodness of jaggery delicately flavored, has, thanks to her efforts, become popular and gaining ground all over Myanmar, and is one of the top Myanmar specialties carried back home by tourists. Today it is not only a great souvenir, it is back as an integral part of Myanmar’s identity. Palm tapping is considerably reduced and there are fears of it being a dying cottage industry. This is due to various constraints not entirely attributable to economic growth and development, offering alternative employment with higher earning potential even in rural areas. Families that were once content with their earnings of 10,000 kyat a day from selling 40-50 kilograms of jaggery per day, now prefer employment in hotels and restaurants in the vicinity which multiply the family earnings at least three times when three members go to work. Additionally, they have access to a cleaner safer life, without having to climb 25-30 trees a day, risking falls, injuries and sometimes even death. The end result has been a decline of 50% in the last five years, and an estimated 5 million trees are left today. The rest have been cut and sold for paltry sums, and in some cases, the land has been sold off as well. The current trends of high blood sugar levels and ensuing lifestyle diseases like diabetes, refined white sugar is best avoided from an early age. But that does not mean giving up on all sweets. Organic sweets like palm jaggery have a long list of health benefits. A low glycemic index, totally natural and high fiber and mineral content, palm jaggery aids digestion, has a cooling effect, clears the respiratory tract, and provides energy with its richness in iron, magnesium, calcium and phosphorus. A general awareness about eating healthy has made the masses turn towards organic, natural foods and avoid processed ones. Products like jaggery fit into this category, providing energy and nutrients without any harmful side effects, not even weight gain, despite being sweet. At the macro level cottage industries like jaggery production offer a viable self employment route, a way out of poverty, a source of daily earning and an opportunity to a better life despite the risks. The Myanmar government is also stepping in to help improve the condition of the country’s toddy farmers, by providing loans and technical assistance, modern climbing equipment that reduces risk of injury and fatal falls. The farmers are also being offered expertise to grown new, healthier palm trees, and set up mechanized jaggery making processes for more hygienic products. Thousands of years ago, Gautama Buddha found that suffering is part and parcel of everyone’s life, albeit in different forms. For some suffering is physical, causing torturous pain. For others, it can be mental suffering manifesting itself in myriad ways. This reality was termed ‘dukkha’, which means sorrow, misery or sadness by Buddha, an unalterable universal truth tormenting every living being, even though its root cause differs. Is it necessary to surrender to this ‘dukkha’ and lead an unhappy life, or find solutions to be happy inspite of it? One road in the pursuit of happiness leads to the famous Vipassana technique of meditation discovered by Gautam Buddha, and popularized in our generation by S N Goenka, an Indian who was born and brought up in Myanmar. He gained access to this centuries’ old technique of meditation from Sayagyi U Ba Khin, who belonged to a chain of Vipassana teachers, passing on the gift of this technique to a small group of people, who took it forward through successive generations. Vipassana though first discovered in India, got lost in its country of origin but continued in its pristine form, in the interiors of Myanmar, passed on from generation to generation, bringing benefit and transforming lives of thousands who followed this path, and from here, spread across the globe. The Vipassana technique appeals due to its rational, scientific base, devoid of religious leanings, blind faith or iconic leaders wishing to be worshipped as gods themselves, and serves only to improve individuals at the root level, teaching them how to live in peace and harmony with their surroundings, accepting rather than reacting to people and situations, finding contentment all around. There is no cult to join, no push to belong, only a desire to improve the lives of people, and help them overcome their endless cravings and aversions. It is this that Vipassana meditation seeks to teach us all – how to accept reality just the way it is. Meditation has been the recourse for calming the anxious, racing mind, plagued with thoughts that cause restlessness. There are numerous variations in techniques of meditation but the essence is the same, to build concentration and reach the deepest core of the mind, constantly looking inwards. Vipassana helps on multiple fronts, during times of stress, illness, melancholy and helps one sail through difficulties, simply by observing our feelings and emotions, being aware and accepting them, and gradually watch them pass away. This stems from the reality of impermanence, since nothing lasts forever, whatever begins, comes to an end, whatever arises, passes away. What comes today will go away after a period of time, however short or long, and anything that is made, will perish one day. There is nothing like permanence, eternity, lasting forever, and this is true of the tangible and the intangible. It takes us very long to understand our existing state of mind that wants the good to last and the bad to end. But nature is not selective. Anything and everything that arises, also passes away after some time. We are the ones who have to learn to be equanimous, not reacting to either. Entering the realm of vipassana meditation, is ethereal, and so different from the stressful world outside. The ambience is conducive to feeling a beautiful silence, and meditation brings stillness, establishing an inner calm and the mind begins to move towards clarity. This is partly due to the ability to renounce worldly ties and material comforts, albeit for a short period, abandoning negative thoughts and emotions and letting go of attachments while improving on defilements that plague our lives. The end result is the lightness of spirit and the realization that we actually need very little to survive, and have unnecessarily made our existence so complicated and burdensome. Even as we meditate we have to rise above the feeling of joy when we are able to concentrate or develop an aversion towards the inability to do so. Vipassana meditation has become a significant topic of conversation, continuing to gain popularity as a meditative technique, and a step ahead of simple mindfulness. Its roots in the teachings of Buddha, help us all adopt Buddhist principles and follow them to lead a highly moral life, which can either be defined as Buddha’s eight-fold path, or as the path of goodness and morality with no room for hurt, harm, dishonesty or negative, devious behavior. To the layman, Vipassana remains an enigma, often considered a fad, and a seemingly unsustainable way of life. Nothing can be farther from the truth, since Vipassana transforms lives, teaches us to look for solutions within, rather than blaming the world for the problems we face, gaining control over our sharp and overactive mind, and helps us understand the true meaning and purpose of life. The Meditation Routine – Too Rigorous? Often, in social conversations, one hears people ignorantly wondering how one survives without phones and laptops, television and internet, in silence for a seemingly long duration. It is ten days of peace, calm and quiet solitude, when survival is limited to our own frame, and not beyond, without aides and distractions, not even pen and paper. It is a time to rediscover the potential of the human mind that does not really need any of these addictive belongings that we become so dependent on. We can remember whatever we wish to, we do not need to stay connected and updated all the time, and we are dispensable, the world can continue without us. Hence, we can focus on purifying and cleansing the innermost folds of our mind, rid ourselves of the numerous defilements and overcome the urge to react, and create sensations in some part of the body at all times. For the sceptics, and self-defined restless individuals, the answer to their query about the impossibility of surviving without books, laptops and phones, is that the course provides abundance of food for thought, unimaginable amount to learn and practice, that none of these would be missed. We walk in for the course not out of mere curiosity, but with complete preparedness that we wish to learn this highly scientific technique and would like to understand the complex mind. The challenge is the prospect of renouncing the world and our relationships for ten days, and adopting the life of a monk/nun for this period. There is no religious conversion, no questions about one’s faith or beliefs, beyond a request to devote these ten days to vipassana alone, and be completely devoted to this deep operation of the mind focusing only on our breath and sensations in every part of the body. The ten days are tough but get easier with every passing day, and soon we step in to a haven of peace and tranquility, an ideal environment to begin the journey into the deepest recesses of our mind. Life becomes the simplest possible with minimal materials for rest and survival. Which brings us to the realization within the first couple of days, how little we need to survive. We learn to focus on our breath, for the first three days, the simple process of breathing in and breathing out, restricting our focus to a small triangle area between the nostrils and upper lip. And with each hour of breathing practice we are sharpening our mind, scraping off layer after layer of past memories, unpleasant thoughts and unnecessary notes kept in the diary of the mind. Gradually we reach deep within and from here then we begin to build on mindful awareness to feel sensations however gross or subtle. This begins on the fourth day when the mind and awareness has sharpened and focus is enhanced. This is the Vipassana technique, which teaches us how to focus on sensations on every inch of our body, going deep to the core. There is pain, burning, tingling, sweating or anything else, the idea is to observe and focus on it. It appears like an x-ray of our system as we pass the observation lens over the body inch by inch. And as this happens, the mind gets purer and purer. We let go of negatives, piled up pain and misery, clear the baggage of the past that has burdened us, and layers of these get cleared from the mind, leaving a crystal clear, thinking, observing and pure mind, making us feel lighter, happier, and calmer. One feels when the course ends, that purity has been achieved for life. Not really, since getting back into the real world means layer after layer of dust and deceit, impurity and negativity, begins to fog the mind all over again. The world today is a complicated place and the prospect of a peaceful, harmonious life appears tough and challenging. Our lives are laden with problems and ailments, and most of us remain disillusioned because things almost always, do not work out the way we would like them to. The normative, or what ought to be, seems to dominate and control our minds, more than the positive, that simply states, what is. In simple words, we all find unwanted things happening and we do not usually get what we want. This holds true for the entire human race, across religion, class and stature. Illnesses are more often the cause of a restless mind and all mental attitudes, which trigger disease-causing reactions inside the complex human system, and we watch helplessly as life wilts away. But the mind is our own, it will think as we train it to. We overthink, over indulge, overanalyse, and overimagine. We attribute qualities, good or bad, to everything and every action, we pass value judgements as sermons, and often, a simple thought or deed, becomes a discord-causing phenomenon. The result – we seldom see reality as it is. The mind wanders, there is restlessness, anxiety, anger and all kinds of emotions surfacing multiple times in a day. Sometimes we are besides ourselves with anger, unable to control our fury, and at others, we want to cry out of misery, sorrow, displeasure. We are hurt by what others say, and often ourselves say horrible things to others. We raise our hands to hit, or often lash out with our tongues. And after a few minutes pass, we apologize and we are so ashamed of our actions-we had lost control, we weren’t thinking, and were driven by a manic desire to hurt. Such is human behaviour, that torments and upsets. And instead of looking for solutions within, what triggers such strong reactions, such manifestation of frustrations, we tend to blame the external environment, and attribute our outbursts to the outside world. Negatives also create sensations in our body, which appeal or repel, and even the blame game- being able to blame another, triggers an appealing sensation. We never seem to realize that we cannot control every element beyond our physical frame, and we can only control our own reaction to situations, circumstances and incidents. Controlling reactions to the extent of becoming totally nonreactive to statements and situations is one of the toughest endeavours, requiring self-control, the ability to think and act rationally, and being mindful. This is a long journey and often takes years, since at every step, every minute of the day, things do not happen the way we want them to, and external forces act to create frenzy and anxiety. We expect wonderful things to happen, expect life to be smooth sailing, and nothing untoward happening. The culprit here, is expectation of the best and the easiest, without chaos, ripples or problems, a craving for the joyful, and an aversion for the unpleasant. Expectations reflect a mind set that is far removed from reality. Somehow the concepts of good and bad entrenched deeply, impact our thinking and make us expect. The words -I wish, I hope, I pray, I want…are all manifestations of our expectations which define our actions and activities, not to mention being “I” focused. The end result is a turbulent mind, restless and searching for solutions to life’s problems, a search for peace, calm and contentment. The search lands people in religious pursuits, chanting and praying, visiting shrines, temples, mosques and churches, joining cults, following new age gurus, reading and finding intellectual explanations, in the real physical world that we exist. Dogmatic rituals, chanting of hymns, idol worship, are often instilled early in life and we tend to blindly follow them, without ever questioning their use, validity, need or purpose. Many have deep religious beliefs and others treat prayer and worship as an insurance policy that can be encashed. Perhaps we lack that faith in ourselves and feel the need to have some thread to hold on to, some faith that will tide us through difficult times, and are convinced that prayers help us achieve our goals. Despite all this, the majority is not able to find the elusive peace and contentment. We go about the business of living, frantically running, ticking activities off a long list, and end up with physical exhaustion and are mentally drained. The mind is on what we call ‘a short fuse’, reacting strongly at the slightest provocation, switching off from the current task at hand, flitting from one issue to the next, and not managing to do justice to any, least of all to its own self. A mind at peace, not in turmoil, composure and calm demeanour at all times, unaffected by pain or suffering -is the ultimate human goal. But the trials and tribulations of daily life prevent us from achieving this and we find ourselves stressed and agitated, sleepless and restless, unable to focus, even as we invite lifestyle diseases to plague us internally. Introspecting individuals while searching for solutions, and exploring avenues that will help them find peace and contentment, realize that the solution lies within not without. The journey inwards in the deepest folds of the mind is not easy and if scientifically pursued repeatedly and consistently, is bound to yield results. The starting point is a conscious effort to be aware, to be mindful, focussing on every action, and giving it full attention. This is even tougher in today’s world where multitasking is the norm, and starts at a young age. We allow our children to eat while watching television, study with music playing in the background, sleep as we sing or read to them. As parents we feel that the ends justify the means-the child must eat properly whether he or she likes it or not, studies and learns while his/her favourite song plays, and sleeps soon enough. In reality we are distracting him/her from the principal task, and he/she spends the rest of his/her life deviating from mindful actions and working with distractions. To be aware, to live in the present, not adding weight of judgements, to actions and statements, is all important. We treat every simple statement as a loaded complaint coming with the baggage of the past. We are often told to address only a current issue and find a solution to the current problem. But we begin with the past history, which often changes the current picture. As in everything else, whatever arises, passes away. But somehow we never let the negatives pass away-we let them fester, and grow-negatives like anger, attitudes, and habits which are the outcome of repeated actions. As they say-whatever you practice, grows stronger. Shaking off the past, living in the present, being mindful and equanimous, all require a desire for self-improvement through introspection, looking within. This is where religion, faith, belief and following godmen begins. Millions are turning to some form of meditation, mindfulness practice, chanting, seeking refuge in dogmatic religious practices, or following of the hundreds of spiritual gurus who claim to offer solutions to problems and promise a happier life. Only a select few seek rational, scientific solutions through self observation that takes us on a journey to the very core of our being. Meditation is a journey inwards, not along an external path, that takes us into the deepest folds of our minds, look at the defilements that plague us, the endless layers of negatives that torment our soul, and the baggage of the past that bow us down. As we sit in concentration, be it by focusing on our breath, or chant, or sing or pray, the purpose is the same. To break the chain of thought, focus on the present and veer the mind away from its state of turmoil, frenzy and anxiety. Meditation is a technique, a skill that can be learnt and perfected to observe something that exists, be it the breath (the incoming breath and the outgoing breath), an external object (perhaps a deity), a point like a dot in the center of the forehead, a mantra or verse that is repeatedly chanted, and so on. The purpose is the same, to observe what exists, without judgment or emotion, and eventually being able to understand the reality better than before. The idea is to calm the mind, slow down the pace of racing thoughts, relax and eventually reach a state of ‘thoughtless awareness’. It signifies peace and quiet, sitting still and nearly motionless in a place so quiet, that one can hear one’s own rising and falling breath. Skeptics would compare meditation to sleep, since both involve quiet, motionless stillness, except that while meditating one is totally, completely aware, alert, and focusing within rather than without, with a mental state that has no room for the past or the future. It does not make the mind a switch that can be turned off and on, it is something that the mind learns and perfects, and ever after, learns to be alert and aware, observes but does not always react, and tries to stay in the present moment. Meditation helps us improve our focus, resolve our doubts, fears and insecurities, get rid of our stress and anxiety which impact our health, and helps us lead a better life, and also simultaneously improve the environment around us, since we learn to get rid of vices, bad habits and defilements. Women rediscover themselves when they become mothers – they realize their ability to love unconditionally – to put the needs and comfort of a tiny being before their own-melting at their offspring’s helplessness and finding their innate ability to be brave and strong whenever the child needs help, no matter how often. That is the time the story of a mother’s giving begins- sheer altruism, empathy and selfless devotion, with no expectations of any kind. Motherhood also completes women as individuals, improves their personality and brings out the best in them. Motherhood is not a need-it is a choice-a choice that will try our patience for the next 20 years, if not the rest of our lives-push us to the brink of sanity-but the tipping point, thankfully, never comes-the cup never brimmeth over. Strange, how nature has fashioned women-with our large hearts that give more than they can hold-that embrace and get embroiled in every aspect of their child’s life – making his life their own. The protective, nurturing instinct comes to the fore and the child forms an entire world for them. The mother is perennially undaunted by the prospect of losing her own identity and foregoing her interests completely as she molds the personality of her little ones. Her devotion and commitment extends far beyond the call of duty, driven by affection and the strong sense of responsibility towards her children. She saves them from awkward situations, protects them from the barrage of reprimands, scolding and punishments, always ready with excuses on their behalf, even tough it means bearing the brunt of immediate and extended family. For the mother, its not about herself, and what she has to endure, she has to protect them from hurt and discouragement, and teach in her own way, that is hopefully more positive. Her rapport and closeness with the children, she hopes, will help her achieve, what others’ complaints will not. Its not that she is not proved wrong, she is, because they do not often see the mother sandwiched between two generations, they seldom can see beyond themselves, and her softness becomes her undoing. But somewhere along the way, ego, ambition and unfulfilled dreams get added and many mothers end up living their lives through their children, pushing them aggressively and adding stress and pressure in a world where children carry numerous other burdens to keep up with their peers, who may often be abusive, mentally, if not physically. We may have given life to our children, but cannot control it completely. It is our duty to provide for them, nurture them to be responsible citizens and fine human beings, but give them space to blossom and grow too. We cannot fulfill our incomplete dreams through them, or use them to achieve what wasn’t within our reach. The joy should be to see them achieve on their own, providing the perfect environment to excel, develop a good personality and evolve a code of ethics, values and principles of the highest order, where purity, peace and sincerity are all important. If we push our children, it must be so that they can build a beautiful, successful life, and they never regret missed opportunities and wrong doing, or losing out due to sheer laziness and the very human habit of procrastination. Parents nurture their offspring for as long as they are together. Nurturing covers a wide spectrum, including so much love that it lasts a lifetime, care that is unparalleled, and discipline, which teaches children how to conduct themselves, know their limits, and give space to others, including their parents. And one day, it is time for the children to fly…build their lives, cultivate their interests, learn and acquire skills and degrees that will sustain them through their adult years. Though times have changed, communication and accessibility keeps parents and children connected all the time, the mother is left forlorn, seeming to have lost her purpose in life and the very reason for her existence. It requires so much strength to fight this feeling and overcome this state…for decades she has forgotten to think and feel for herself, never puts her own needs before those of her children, and often, does not even remember what she likes. That is when the waiting game begins-for their calls and messages, for them to come home during vacations, and for chances to meet for short breaks. The parenting, the support and the care continues, but an emptiness fills her days, with no frenzy, and not much to look forward to. Perhaps the mother child bond supersedes all, but their leaving home must lead to a new beginning, a journey of self discovery for all mothers, to learn what they now like, as older, wiser and mature women, and learn to find completeness in their own being. The white nectar that sustains infants and builds their body and bones in the first year of their life, the wholesome liquid that nourishes and nurtures those unable to eat solid foods, and the rich source of calcium, is slowly weaving its way into the average Myanmar diet. Supermarkets now stock a wide range of dairy products like yoghurt, cheese, buttermilk, cream, butter, ghee, milk powder, evaporated and condensed milk, many of which have a long shelf life. The product range and variety has increased manifold in the last 5-7 years, with more local small scale manufacturers experimenting with newer products as well imported dairy products lining shelves. Traditionally, milk was never an important part of the average Myanmar diet, as has been seen in other less developed countries. It has also been seen that milk consumption increases as communities and countries develop, earning capabilities improve and awareness about health and nutrition increase. An increase in income leads to the incorporation of milk and dairy products in largely starch based diets. There is a strong correlation between income and milk consumption at the micro level, and between the dairy industry and stage of economic development of a country. At present milk consumption in developed countries is steady, but growing the fastest in Asia, Latin America and the Caribbean. India is the world’s largest producer and consumer of milk if we combine the production of cow and buffalo milk, though the U.S. is the world’s largest producer of cow’s milk. The general reference to milk implies cow’s milk, and in some places, buffalo milk, though milk can be procured from other mammals just as well, and from plant based sources like soya, rice and almonds. Cow’s milk is the highest consumed milk due to the nine essential nutrients it contains, including calcium, potassium, and the daily human requirement of protein. Cow’s milk has better flavour and texture, followed closely by buffalo milk which is popular in very few countries, India being one of them. Cow’s milk has an 87% water content and 13% solids which include minerals, proteins, fats and lactose. Proponents of milk consider it to be nature’s complete nutrient for humans, providing calcium which is needed for better bones and teeth, and prevents osteoporosis in old age. Daily intake of milk helps to neutralize toxins which enter the body through other foods and can damage the human body. The nourishment derived from milk helps sustain energy levels and keeps our minds and bodies active. For infants and those without teeth, a milk and dairy diet is complete nutrition for growth and sustenance. Health experts are convinced about the role of milk in controlling blood pressure and diabetes. Milk is by far the most nutritive beverage and widespread propagation of its importance as an essential dietary requirement has led governments to encourage setting up of dairy farms, both small and large. This includes nurturing animals, collecting and selling milk. This is not simple at all and the journey from cow to cup is rather long. Raw milk taken from the cow has to be processed to make it safe for human consumption. Being highly perishable, raw milk lasts for only a few hours unless refrigerated. Therefore, large dairy farms typically collect milk in refrigerated stainless steel containers and send them to milk processing plants where milk is passed through a series of separators and clarifiers which remove debris, bacteria, and also separate heavier and lighter milk. Essentially milk has to be pasteurized to kill any harmful bacteria. Pasteurization involves heating milk in a specific manner to kill all harmful bacteria but retaining the good bacteria and natural enzymes. It also helps to extend shelf life of milk. The next step is homogenization, a process used to crush the fat globules floating in the milk solid, to make them so small that they cannot rise to the surface and form a thick creamy layer. Milk is also differentiated by fat content, and a set of processes render full cream, low fat or skimmed milk. Vitamin fortified milk and flavoured milk are other varieties produced. The milk is then packaged and sent to various destinations in refrigerated vehicles, though long-lasting varieties can be sent through normal vehicles. All types of commercially packaged milk has to meet stringent standards set by a regulatory authority of the country. Quality control is important and has to be maintained by ensuring hygiene and cleanliness levels of the milk processing plant, as well as the health of the animal that provides the milk. The diary sector in Myanmar is in an early stage of development. Research indicates that almost 85% of Myanmar’s milk comes from small dairy farms, that sell raw milk, due to limited processing facilities, to consumers and businesses close by. The annual production of milk is around 620 million kilograms, and this is less than half the national milk requirements. The Yangon region has seven large milk processors that process raw milk collected by a small network of milk collectors who in turn procure raw milk from very small dairy farms within a distance of 30 km. Quality control and certification of the milk processed is not a regular practice. The gradual increase in incomes is spurring demand for milk and milk products, which cannot be met by domestic production. The range of milk products commonly consumed include fresh milk, flavoured milk, yoghurt, plain and flavoured, milk powder, condensed milk, and ice cream. A big source of demand comes from the thousands of tea shops across the country that sell millions of cups of tea laced with generous amounts of condensed milk. Most of this is imported since the local varieties produced in factories in the Mandalay region are unable to compete with imported condensed milk in terms of both price and quality. Milk powder is used extensively in the making of highly popular 3-in-1 tea and coffee sachets. The gap between demand and supply is being met by imports from Thailand, New Zealand, Singapore, Malaysia, Australia and other countries. A large segment of this is milk powder, that is also sold as reconstituted milk. According to commerce ministry figures, in a single week in July 2017, 409 tons of condensed milk and 70 tons of milk powder were imported into Myanmar via sea routes. Regular imports from neighbouring Thailand come from the land route across the border. Some of the leading local brands include Walco, Silvery Pearl, TM, PEP, Fun Hwa and others. This is fresh pasteurized milk in full cream and low fat varieties, but available mainly in the Yangon region. Imported long lasting milk brands include Cowhead, Emborg, Dutch Lady, Foremost, and scores of others, some of which also sell milk powder, condensed milk and evaporated milk in supermarkets and smaller shops lacking refrigeration facilities. Despite the setting up of various bodies like the Myanmar Dairy Association and Myanmar Dairy Products Manufacturers Association among others, the dairy industry faces multiple stumbling blocks to increasing supply, like inadequate infrastructure, lack of funding and financing options, no access to technical expertise and advisory bodies and others, all of which are essential for improving the quality of milk and making each step of the milk producing process efficient. The dairy industry is at least two decades behind its Thailand counterpart with lack of access to continuous power supply, adequate refrigeration facilities for storage, and reliable transport. Increasing livestock to increase production would be easy, but related issues at every step of the production process need to be resolved first. Milk and dairy products became a part of the human diet as early as 8000 BCE. Cattle breeding and livestock have sustained civilizations over centuries and milk served to provide essential nutrients in the absence of other foods. However, Southern Asian nations did not include dairy and dairy products as an integral part of their diet, and this trend has continued over centuries. It is only in the last few decades that these nations have started incorporating milk and dairy products into their diets. The small interest in milk and dairy products began during British Rule for local Myanmar folk, and the Indian influence on food kept that going. Even today, Myanmar’s dairy industry can follow the Indian example, where its Operation Flood, launched the National Dairy Development Board, initiated an unstoppable ‘White Revolution’ and converted India from a milk deficient country to the world’s largest producer, besides generating employment especially in rural areas. The similarity in cultures of India and Myanmar, their proximity and willingness to share knowledge makes India the ideal neighbour to take a cue from. 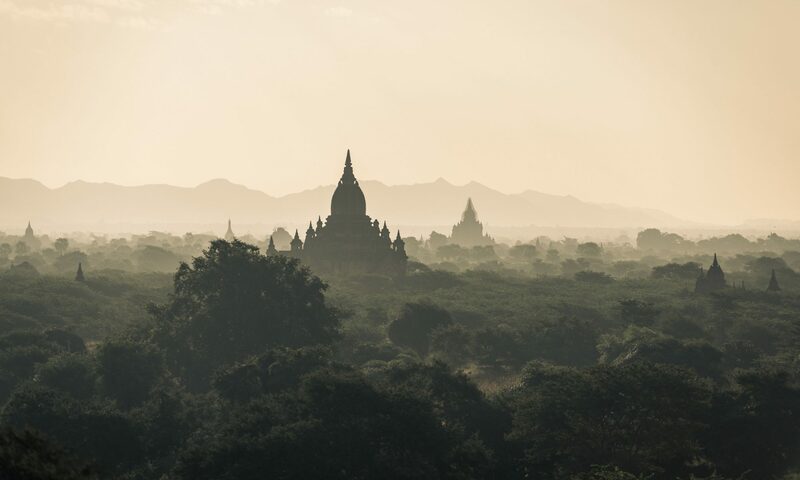 A trip to Myanmar is exciting for all the magical, mystical experiences that await us, the untouched natural beauty, serene environs, beautiful pagodas and the innocent beauty of the local Myanmar folk. The only shadow is cast by the prospect of my being a vegan! Will I be able to find pure vegetarian, dairy free food to survive? My research revealed that there wasn’t much to worry about even though local fare revealed extensive use of eggs, meats, shrimp pastes and fish sauce, but “tat-tat-lo”(the Burmese word for vegetarian) was to be my saviour, followed by pictures of milk, yoghurt, cream etc., since I couldn’t find a Burmese equivalent for vegan. As I stepped of a modern, plush international airport at Yangon, I was sceptical and was contemplating a minimal, survival diet, when the taxi ride to the hotel revealed umpteen tea shops and shanties selling seemingly vegetable savouries. As I set out on my sight-seeing tour, I was pleasantly surprised to see the road side vegan options, and knew that restaurants and food courts would have much more. I was relieved that I would not have to stick to upscale star-rated hotels for food and request for special meals through the length of my stay here. I wanted to try my first Burmese meal, and which better place than the famed Rangoon Tea House. A relatively new eatery, it has worked its way into the “top ten things to do in Yangon” list, in a very short span of time. Just expressing my vegan preference sufficed to get me their signature Tofu salad, Peas Paratha and Aubergine bao. Numerous other options were present in the menu, and I was told that eliminating fish sauce and shrimp paste, commonly used in Burmese cooking, would transform the dish into completely vegan fare. A visit to the supermarket helped me see that the locals do not seem to have a milk drinking habit, though yoghurt is consumed, and tofu is far more preferable to cheese. The yellow Shan tofu had an instant appeal and its taste unparalleled. I learnt about Shan food and the numerous vegetarian and vegan options it offered, and decided to try the 999 Shan Noodle place for my next meal. By the end of the first day I knew, that I could survive on the exotic Myanmar salads and asking for “tat-tat-lo” would get me my vegan preference since I learnt that none of these had any dairy infusions. Myanmar cuisine options stretched into a long list for me, Monsoon Restaurant visited by Bill Clinton, House of Memories owned and run by a family closely associated with Gen Aung San, Padonmar Restaurant known for its celebrity clientele, and scores more. Tea shops and tea salons are as popular as cafes, and each offers vegetarian snacks, some of which are vegan too. As a walked in the downtown area, I came across the Nepali Indian Food place on Merchant street, which serves pure vegetarian fare. My knowledge of Indian cuisine told me that vegetarian can easily be transformed into vegan if I request them to eliminate milk and cream for their recipe and not opt for any ‘paneer’ dish. Paneer is the Indian cottage cheese and a favourite of all vegetarians. Yangon now boasts of 33 Indian restaurants including 3 fine dining ones. My exploration of Yangon showed the amazing variety of cuisines available, like any other cosmopolitan city, with Chinese, Thai, Japanese, Korean, Italian and other restaurants, both big and small. Asian cuisines are more vegan friendly, but Italian food without cheese and their tomato based sauces are equally palatable. Set menus of course, were a no-no, since there was always a course or two, with dairy based dishes. I found that bread was an avoidable option since most breads contain egg here, so breakfast was also distinctly local, with tat-tat-lo mohinga and khow suey,both of which savoured each morning. Desserts were mainly fruits , an amazing variety of them, each of them sweet and juicy. My biggest discovery was Nourish Café in Yangon Yoga House, that advertises for serving plant based food to nourish body and soul. It is only as I walked in, that I realized that it is Vegan Café with a full vegan menu! For long, I had felt my switching to veganism would be limiting for my love for travel, to new destinations, but my few days in Yangon have proved me wrong. For me, being a vegan is a lifelong choice, and I will never be able to take in a morsel of meat or dairy products again. Veganism is a subset of vegetarianism and refers to plant based diets and an animal product free way of life. It has caught on in the Western nations much more than it has in Asia. Veganism is the latest, glamorous fad, and has become a part of one’s identity. Every celebrity who is vegan, is introduced so, almost adding to his/her credentials. It may be in vogue to protect animals, talk about cruelty to them, and be ‘the voice of the voiceless’, and hence give up on animal foods. But it is not easy to give up on dairy, seasoned as we are, to consume milk and milk products from the time we are born-the single diet component that spurs growth for the first two years of a child’s life. Vegans have done this and switched to plant-based milks like soy and almond milk, among others. Veganism is an off-shoot of vegetarianism, a subset of people who eat plant-based foods only, and do not consume any dairy products either. A vegan is a person who does not use or consume any animal product – food, clothing or accessories, anything that involves cruelty to animals. Thus, they do not have fish eggs, meat, poultry, milk, dairy products, even honey. Vegans also do not buy or use leather bags and handbags, wallets and belts, leather jackets or fur coats. Being a vegan is a choice for health, environment or ethical reasons, and in today’s world, there is no dearth of non-meat, non-dairy options. The repertoire of vegan foods and preparations is multiplying, with vegan substitutes making up for all that one may have missed, in the form of exotic cakes and pies, puddings and cheesecakes. In countries like the UK and USA, where a higher number of vegans are found, vegan curries, vegan pizzas and cakes are commonplace, as much as a wide variety of meal options. The vegan food list includes fruits, vegetables, pulses, nuts, seeds, and beans. Soya products become an important source of protein, tofu substitutes cottage cheese, and soya also forms the base for mock meats, mock cheese, and soya milk is used as the perfect milk replacement for drinking and for yoghurts. Peanut and other nut butters replace the dairy butter and are richer in nutrients. Globally, plant-based diets are gaining ground, and even the biggest meat eaters are beginning to notice the benefits of incorporating fruits and vegetables into diets. Surveys indicate a rising vegetarian trend, though countries like India which have over 30% of its population as vegetarian, attribute it to religion. The number of vegans is on the rise, and the flip side of consuming milk and dairy products is gaining ground. A section of scientists and doctors are propagating a dairy free diet for all the ill-effects of milk produced by cows that have been pumped with antibiotics, growth hormones and a diet that only makes them give more milk. Milk produced by cows that graze freely and lead normal lives, without human intervention or prodding, is the only safe nutritional source, not what we buy from supermarkets etc. This is also one of the many reasons behind the wave of veganism that has caught us all.